Hanukkah in Judaism, andthe menorah and the dreidel that are its symbols, help us appreciate the depth of Torah and the beauty of a Torah life. Is Hanukkah just a “minor” holiday and the dreidel a mere toy? More often than not, including secondary colors into a pattern or minor notes into music creates a richness and fullness that give greater meaning to the original work. Such is the case with Hanukkah in Judaism, and with the menorah and the dreidel that are its symbols, for they help us appreciate the depth of Torah and the beauty of a Torah life. Surely celebrating for eight days, lighting candles each of those nights, and continuing to play with the same simple toy for over two millennia has more meaning than just partying and a passing fad of a plaything. 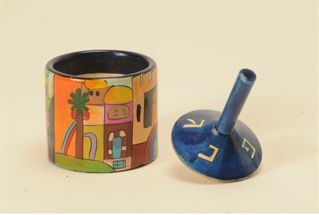 Well known is the idea that playing dreidel tricked the Assyrian/Greeks into believing that the Jews were meeting to play or gamble rather than actually congregating to study Torah, observe Shabbat or perform a brit milah. But the shape of the dreidel and the particular letters engraved on its sides have profound meaning. These letters, nun, gimmel, heh, shin in their simplest meaning (not as they are used for play) refer to nes gadolhayah sham, a great miracle happened there. It is, however, in reference to their other acronyms that these letters have deeper symbolic meaning and why they are often retained in Israel itself instead of substituting poh, here, for there. Rabbi Aryeh Pinchas Strickoff’s book 'Inside Chanukah' presents us with insights into the deeper significance of the dreidel culled from many sources. First, the very shape of the dreidel is significant. Its four sides represent the four corners of the world spinning on its fulcrum of Bnei Yisroel. That fulcrum is directly connected to the stem that controls the spinning. It stands straight up, for Hakodosh Boruch Hu decides who shall fall and who shall rise and how the world should spin, and Bnei Yisroel is always attached. Discussing the letters themselves, Rabbi Strickoff quoting the Bnei Yissachar goes back in our history all the way to Egypt, the first exile that represents all the future exiles of Bnei Yisroel. When Yaakov was preparing to go down to Egypt, he sent Yehudah before him Gosh-nah, to Goshen to prepare the way for the rest of the family. These are the same letters that appear on the dreidel. Yehudah was charged with making the immoral and decadent Egypt somehow fertile ground for the development of the fledgling Godly nation. This process involved four different areas of human development, each representing a different kingdom that would later try to subjugate us and turn us away from the Creator.Nun stands for nefesh, the spirit and lifeblood of Bnei Yisroel. We were nurtured and sustained in Eretz Yisroel by our Beis Hamikdosh until the Babylonians came, destroyed it, and they sent us into exile beyond the waters of Babylon. Gimmelrepresents, guf, the body. The Persians, under the tutelage of the wicked Haman, tried to annihilate us physically. The Shin stands for sechel, the intellect, which the Greeks tried to subvert to their culture. Finally, Hehstands for hakol, all of the above. Our current exile of Rome/Edom includes elements of all these subjugatons, for we are regularly bombarded with messages from today’s culture that are diametrically opposite from the morality of our Torah, and we certainly face constant threats to our physical existence. Numerical valuations of each of these letters offers further insight into their mystical meaning by juxtaposing these with other words and phrases of equal numerical value. These four letters are equal to the numerical value of Mosh-i-ach, 358. They are also equal to Hashem (the four letter name of God) melech, Hashem moloch, Hashem yimloch leolam voed, Hashem is the King, the Ruler, present, past, future and forever. This is the secret of Jewish survival, for no matter how the world spins, Hashem is in charge, He spins the world on its axis, and He will sustain us until Moshiach arrives. Rabbi Moshe Schwab in Maarchei Lev approaches these four aspects of the human condition from a complementary perspective. Each of these facets represents a lack in humankind that Hashem wants us to rectify so that we can grow spiritually. Each was represented by that kingdom which chose its corresponding area in which to attack us. The Jewish Nation must now take these same traits and reverse them from negatives to positives. During the time of the first Beit Hamikdosh, Nefesh, our spiritual side, was lacking in that we exhibited a sense of haughtiness. Babylon came, destroyed the Beit Hamikdosh, our pride, and humbled us. From that catastrophic era of our history emerged the Babylonian Talmud which strengthened us spiritually. During the Persian Empire, we tried to physically join their revelry, even as the Persians used the holy vessels of the Temple in their drinking parties. They then tried to destroy and kill us physically. We counter our lapse by elevating the physical to spiritual heights. We eat and drink on Purim, as they did in Ahashuerosh’s party, but we do it in praise of Hashem and the hidden miracles He performed to save us. We cherish our social networks not by profane partying, but by sending mishloach manot to relatives and friends, and by giving charity to the poor. Yavan, Greece, tried to lure us into their culture of empty intellect and beauty. They did not try to take from us the beauty of our Torah. 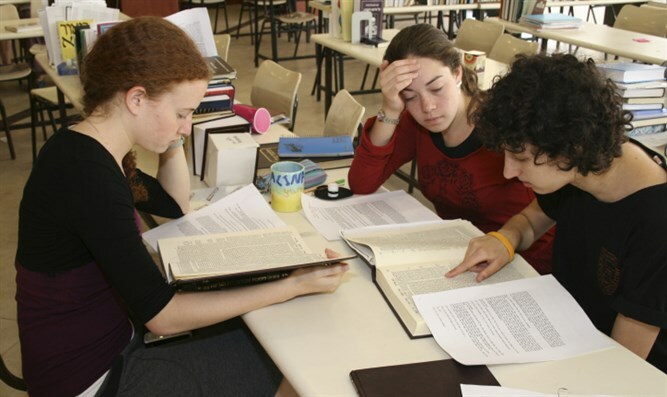 Rather, they wanted Torah to remain a demanding intellectual pursuit, but without the power to transform the inner lives of those studying it. Indeed, they did not even forbid us lighting the Temple menorah, but they wanted us to use impure oil, to divest the menorah of its holy mission to light up the inner world of man, not just the physical surroundings. That’s why they contaminated all the jars of oil. To the Greeks, only empirical knowledge, verifiable by the senses or scientific experiments, had value whereas morality and immorality were irrelevant. To counter this culture, the simple, abiding faith of the Maccabees enabled them to bring the powerful Greek Empire to its knees and reestablish the knowledge that Hashem, unseen though He may be, is the prime Force in the universe. Therefore, explains Rav Reiss, it is important that we not only light the Chanukah candles but also see them. As we say upon lighting the candles, we may not use the flame for practical purposes. Rather, we must contemplate that these lights reflect the light of Hashem within us rather than constituting a form of illumination for our physical surroundings. Rabbi Reiss offers a keen analogy to explain the difference between Greek studies in art or in intellectual pursuits and our own studies in Torah. Observe a statue, he says. It is exact in every detail, perfect and beautiful. Yet it is lifeless. It has no movement, no growth. Now observe a living, breathing human being. It has growth, it has movement. It has an inner spark that infuses its physical body. Such is the difference between Greek culture and Torah Judaism. Greek culture was beautiful and perfect, Greek philosophy challenging. So much so that many Jews were lured into its trap. But Hellenism is lifeless. It cannot impel you to action. The Torah, on the other hand, translates from an intellectual pursuit to practical life, forcing one to grow. Look at the Chanukah candles. Do they represent the ephemeral light of Greece which is nothing more than darkness painted in luminous colors, or the eternal flame of Torah? Rav Pincus teaches us that we must look at all the beauty of the world and recognize Hashem’s presence in every atom of existence and in every occurrence. See not only with our physical eyes, but especially with the eyes of our souls so that we can dispel the darkness of a world without God. As the Netivot Shalom says, the Greeks wanted to darken the eyes of our neshama, our souls, but we are looking for the primal light of creation, hidden since the expulsion from Eden but reemerging in lesser form in the Temple menorah. This is the holy light we are searching for as we gaze at the menorahs in our homes. This is why, says the Shaarei Derech, as we light the candles, we say we must lehodot ulehallel, thank and praise Hashem for our miraculous salvation. We must thank Hashem for His presence in our homes and in our personal lives, and we must praise Him in the public forum. Yes, the question is raised as to why we need to observe Hanukkah for eight days instead of seven, but, says Halekach Vehalebuv, we should demonstrate the pure, simple faith that helped us win the war against the Greek armies and accept the word of our Torah sages even if we do not personally understand the reason for these laws. It is not about me and my understanding, but about God and putting Him at the center of my life. Rabbi Strickoff also explores a secondary theme of the dreidel, this time not about the letters but about the game itself. Rabbi Strickoff cites the Bach in explaining that Hashem allowed the Temple service to be discontinued and blocked because the priests and Bnei Yisroel became lax in its observance. The antidote to this laxity would be dedication and self sacrifice in the observance of the service. The Sifsei Chaim, Rabbi Chaim Friedlander, notes that under the circumstances, it would have been halakhically acceptable to light the Temple menorah with the contaminated oil. But this was not acceptable to the Maccabees. With tremendous self sacrifice, they not only fought the Greeks but searched and searched, hoping to find some pure oil, as pure as the spark of God’s flame they wanted to fan within themselves. Hashem rewarded their conscientious self sacrifice, and let the flame burn for a full eight days instead of one, until fresh, pure oil could be produced. This is a practical lesson from the dreidel game. Just as our ancestors put their own comfort aside at great peril to themselves to observe brit milah or to find pure oil, to put Hashem’s will at the center of their lives, so too should we keep our vision focused on Hashem’s will and restrain ourselves from speaking or doing that which we desire but which is against Hashem’s will. We must begin, and Hashem will help us succeed. As the Damesek Eliezer points out, the dreidel must first be picked up and given movement, and then it can pick up speed on its own. The Maccabees took on a seemingly hopeless task. They picked up the challenge, and then Hashem coordinated the spinning so things would fall in the right direction. The menorah in the Temple was lit with the fire of the outside altar, points out Halekach Vehalebuv to symbolize the concept of messirut nefesh. Although we no longer have the altar upon which to utilize this fire to light our menorahs, we are able to internalize the verses from the Torah that are the centerpiece of our prayer, our service of the heart: “Hear, O Israel, the Lord our God the Lord is One, And you shall love Hashem your God with all your heart, with all your soul, and with all your resources.” This is the light that ignites the menorah that we must strive to integrate, and keep growing within ourselves, to reestablish and strengthen our connection to Hakodosh Boruch Hu that the Greeks tried to sever. One final thought comes to us via the Bnei Yisaschar. We begin each year on Rosh Hashanah with teshuvah and prayers for a good year. The decrees are written on Rosh Hashanah, sealed on Yom Kippur, delivered on Hoshanah Rabbah, and entered for execution only on Hanukkah. The letters on the dreidel can now form the acronym gmar shana, the (new) year is finished. We have the opportunity through the eight days of Hanukkah to try to reestablish our bond with Hakodosh Boruch Hu, to demonstrate our devotion to His Torah and mitzvoth, and dedicate our bodies, minds and spirits to His will, and then we can pray that Hashem will reward our efforts as He rewarded those of the Maccabees of yore, and send the Moshiach for our final redemption.